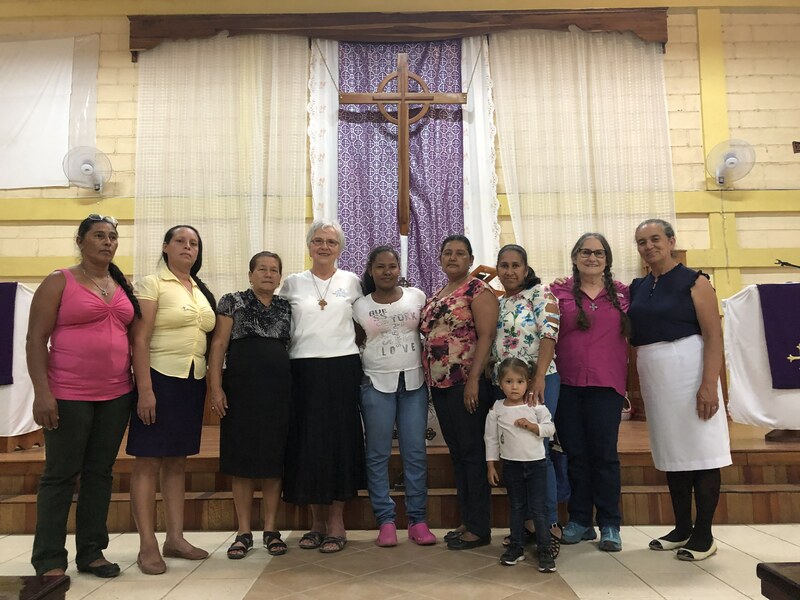 I want to share with you the beautiful Quiet Day we held at Las Manos de Dios Episcopal church in Danli, Honduras on Saturday, March 24. It was hosted by the Daughters of the King, but all women were invited. Fifty women and at least a dozen children were in attendance. We provided lunch for 73 which included children, teens, the kitchen help and a few men. I was able to greet old friends and make new ones. We did the stations of the cross through the eyes of Mary. The church is a big open one and Fr. Victor had placed pictures of the 15 stations all around the perimeter. We moved from one to the other as Fr. Victor recited the Kyrie, Fr. Francisco played the guitar, and the women sang as they walked. Two different women read at each of the 15 stations. One woman started to read and was so overcome she couldn’t finish. Many women commented they felt the same way. The Holy Spirit truly was present. It was extra special to me knowing you all were praying and two chapters from Central PA were also doing Mary’s Way of the Cross that very day…Apostles from Christ chapter from York, PA, and Harriet Lane Johnston chapter in Lancaster, PA.
We had fun afterward. I brought hotel soaps, shampoo, lotion, little bottles of nail polish and bags (like ones we buy at the grocery store, instead of using plastic). We asked questions, like who has the most children, who has on a red shirt, etc., and the woman/ or women would come up and pick 2 items. They had fun with that and so did I. We had enough to give them a third and the leftovers went to the priests to give to the needy. The bags and the nail polish went first. This is a very special event for the women as they don’t usually have an event where they can just come and be fed…physically and spiritually. We paid for the bus and/or taxi for them to get there – some had at least an hour ride. The most expensive was $4 round trip. 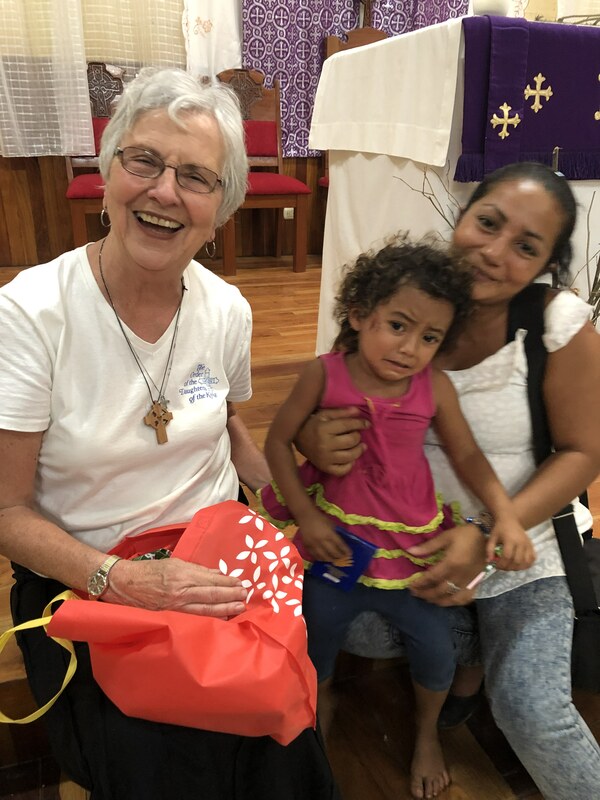 Jeannie Loving, our SAMS missionary contact and Daughter of the King, said most would borrow the money to get there and we reimbursed them when they arrived. We also paid for the food. I noticed some of the women didn’t eat all of theirs but saved some to take home to their family. I couldn’t eat mine and gave it to Mabell whose husband didn’t have a job and they have 7 children. The cost for this was covered by a grant from the Daughters of the King self-denial fund. People here in the US have no idea what poverty is…no electricity, no running water; rice, beans and maybe an occasional chicken added to the mix every day…mangoes and watermelon when in season. The children at the village high up the mountain don’t attend school. It is too far to go down the mountain every day. It took us more than an hour by truck, and they use horses for transport. At the airport, I talked with two different women who come each year to help at orphanages. They are not truly orphanages, but homes for abandoned children. The parents are so poor they can not feed them or they are abused. One mentioned an 11-year-old girl with a 1-year-old baby and this was not an isolated case. One woman said the place where she worked had taken in two infants found abandoned on the road just that week. I’m glad to be home. Physically we found it takes us longer to recover but we are retired so we can take our time….spiritually and mentally will take a little longer. Please continue to pray for our Daughters all over the world. It is a beautiful bond that we have as sisters in Christ. Kathy Paulo is a member of St John’s, Franklin. She has been a Daughter of the King since 2005 and is currently serving as The Order of the Daughters of the King Province lll president and National Membership Chair. This entry was posted in discipleship, Ministries, Mission, Outreach, prayer and tagged Daughters of the King, Kathy Paulo, mission, quiet. Bookmark the permalink.